Taken on Jul. 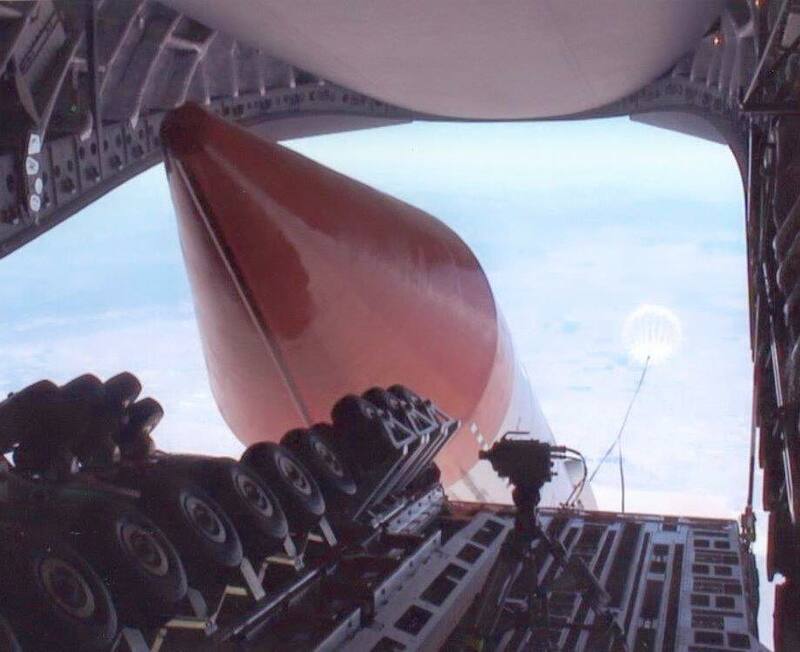 26, 2006, the interesting video in this post shows a U.S. Air Force (USAF) C-17 airlifter dropping a full-scale simulated AirLaunch QuickReach rocket weighing 72,000 pounds as part of the joint DARPA/Air Force Falcon Small Launch Vehicle (SLV) Program. Noteworthy this test, that was planned and executed by a team composed of the 412th Test Wing, Defense Advanced Research Projects Agency (DARPA), and AirLaunch LLC, set a new record for the largest single object to be dropped from a C-17. The team in fact broke their own record established just a month earlier when a simulated QuickReach rocket that weighed 65,000 pounds was dropped out of a C-17 on Jun. 14, 2006. As it can be seen in the clip, for the test a system of rollers was developed to guide the inert rocket out of the aircraft. The Falcon SLV program was aimed to explore a less expensive and more flexible method of launching a 1,000-pound payload, specifically a satellite, into low earth orbit, but also helped expand the capabilities of the C-17 Globemaster III. The airdrop of the 65-foot, 72,000-pound booster rocket mockup you see in this footage was performed at 32,000 feet by a crew of professionals from the 418th Flight Test Squadron, AirLaunch and the Boeing Corporation on board an operational C-17 from McChord Air Force Base (AFB), Wash..